If you’re looking for a Used Car Dealer in Auburn, come check us out at S&S Best Auto Sales. It’s important to choose a dealership that you know you can trust. We’ve worked hard over the years we’ve been in business to provide our customers with the best service. When you want to start working with a new dealership to provide you with quality preowned vehicles, you want to choose a trustworthy dealer. At S&S Best Auto Sales, we promise to be the best Used Car Dealer in Auburn that you could ever ask for. Rely on us to provide you with the quality vehicles, service, and prices that you need and deserve. Once you start browsing through our inventory, you’ll find our inventory is always changing, so there are always new vehicles to choose from. Working with our sales representatives to find the vehicle that works best for you is easy. All around, we want to be the dealership that you trust to provide you with what you need. If you ever get the chance to talk to one of our customers, they’ll tell you that finding what you need is always easy when you come to S&S Best Auto Sales. Our selection is wide and always has a lot to choose from, so no matter what you’re looking for, you’ll find it at our dealership. You can start browsing through our online inventory at any time, right from the comfort of your own home. There are many options to choose from within our inventory. That’s one of the reasons why we’re the best choice in an Used Car Dealer in Auburn. 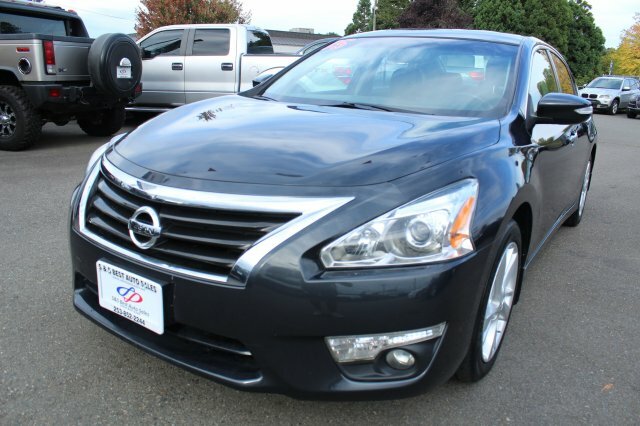 For example, you might find a Nissan Altima in our selection. When you want a car that’s comfortable and safe, the Nissan Altima is the way to go. Want a car that has great fuel economy ratings and will be sure to satisfy the needs of you and your family? Try looking for a Nissan Altima in our inventory today. And when you find something that you like, act fast so you don’t miss your chance. Choosing S&S Best Auto Sales as your Used Car Dealer in Auburn will prove to be fruitful. We always make sure that our customers leave our dealership satisfied with the service they’ve received and the vehicle that they’ve chosen. Contact us today at 253-785-9382 if you have any questions. You’ll find our dealership located at 2712 Auburn Way North in Auburn, WA. We hope to hear from you soon.